This guided deer hunt is exclusively a stand hunt from climbing treestands and ladder stands. This method of deer hunting is often the most effective way to bag these northwoods monsters. Hunters must be patient and persistent while keeping warm and staying focused. They are encouraged to stay on stand as long as possible. The most successful hunters stay in their stand all day and come prepared to hunt that way all week. Deer stands are located in quality areas with higher deer densities and travel routes. These areas are scouted and stand locations prepared before the season begins. Some stands require walking up to a mile or more from the nearest gravel road. Climbing treestands are practiced with guide upon arrival on Sunday. 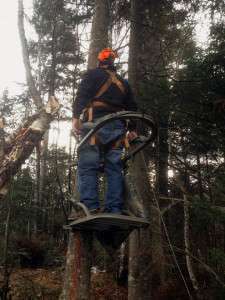 This practice session helps hunters use their treestand safely and quietly, and builds confidence for those hunters that are new to this type of treestand. For our clients comfort and safety, a treestand harness will be provided and a tree umbrella is available on rainy days. We offer several treestand hunts throughout the season. 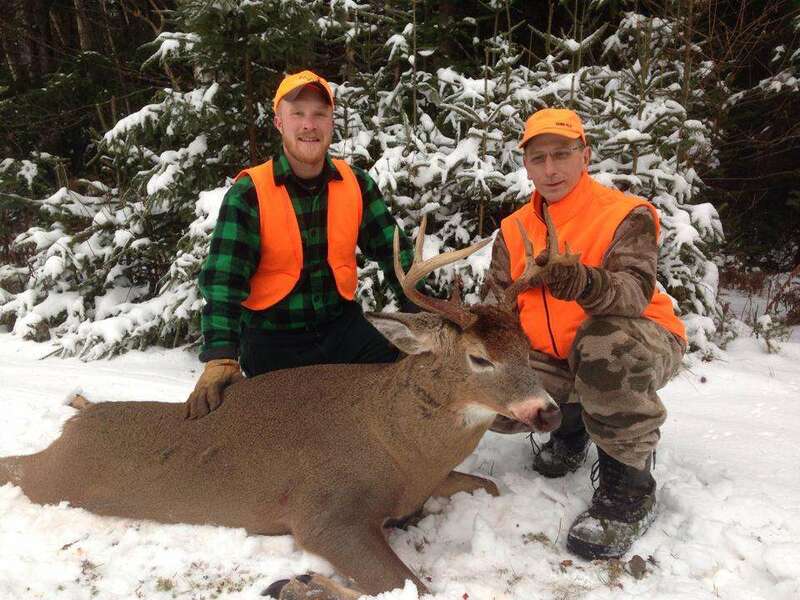 All hunts are six days in duration (Monday thru Saturday). This late season deer hunt can be very productive as bucks travel afar searching for the last receptive does. There is usually snow on the ground and the cooler weather keeps deer active. Hunting License – ($26 Maine residents / $115 non-residents) Hunters must purchase a Big Game license before arriving at camp. For hunting license information please visit the Maine Inland Fisheries & Wildlife website. Gratuities for your guide and camp staff are not included in hunt prices but greatly appreciated.